Protects boats better than traditional round fenders, because they often roll upwards resulting in boat damage. They are also bulky when stowed. 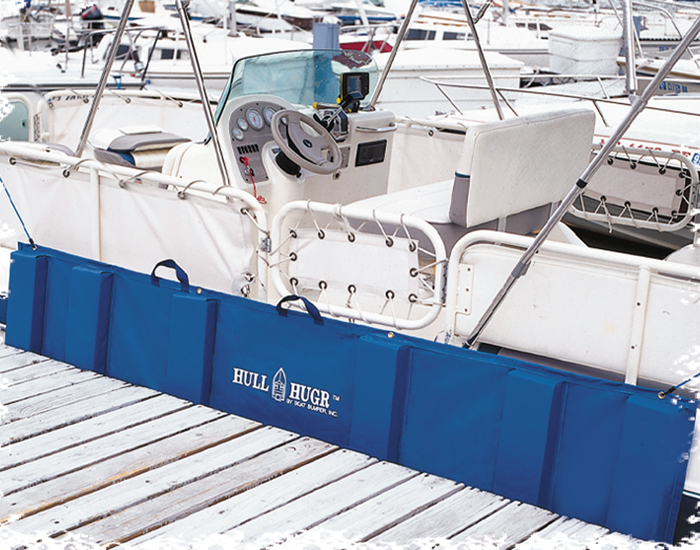 The original Hull Hugr gives your boat or dock more protection than 6 fenders at a lower price. The ingenious patented design folds up amazingly compact. Once folded, stow Hull Hugr, or use it as a cushion or even a table top for shore lunch or a card game on the beach. The UV and puncture resistant marine vinyl / nylon tri-laminate is wrapped around block of closed-cell polypropylene foam to guard against hull damage. Also great for use on docks. THE PURCHASING PROCESS WAS EASY,EVERYTHING SO FAR IS GOING GOOD. The part worked the first time and shipping was fast, very pleased. very smooth and efficient web site. Very easy placing order. Will review again after I receive my order.